If you’re looking to build the best PC you can, it’s tempting to focus on the best graphics cards, processors, RAM and SSDs. But, which PC case do you go with? Do you save some cash, and get the cheapest metal box you can find? Or, do you pick up the best PC case you can find, so your components are kept cool – both in temperature and style? We might be biased, but we’d go with the latter. You won’t just get a more aesthetic experience, but your PC will last longer, too. But, there are just so many PC cases out there right now. And, while this means there are plenty of affordable options out there, it can be hard to get something worthwhile. That’s why we gathered up the best PC cases on the market right now. So, if you don’t know which chassis you’re building in yet, you’ve come to the right place. There’s a popular phrase out there: if you’re going to do it, do it big. We’re not totally sure if anyone ever actually said that, but the Corsair Obsidian 1000D would certainly qualify as ‘doing it big’. Packed front to back with 18 fan mounts and room for four 480mm radiators, this is the best PC case for keeping your system cool no matter how many high-end components you have. What’s more, this is a dual-system case, so you can build two separate computers here. Just think about it – you can fit both your gaming rig and your streaming PC into this single case. The Antec Cube is without a doubt the best PC case for you Razer fans out there. While Razer hasn’t made its own desktop PC (not yet, anyway), you can build a Mini-ITX gaming PC, pretending it’s a razer product. 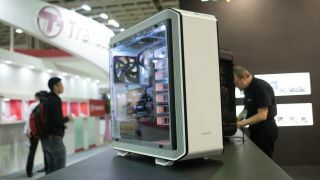 You see, Antec partnered with Razer to bring its signature green-infused flare to the Cube, a small form-factor chassis. Complete with a deceptively high amount of space for future expansion, the Antec Cube is also compact enough to travel with.